Make the day go faster! Let’s take a look at some great podcasts to listen to. Whilst I’m working in the day I do a lot of the regular type of jobs you’d expect. Such as checking emails, writing for blogs and using social media. I hate it to be silent in my house for a long time, I expect others in my position are the same as well. My cure is to listen to podcasts. Podcasts are much better than most TV shows in my opinion, especially in the day-time, and after a while too much music can get irritating. I’m not a fan of the radio. Plus watching old DVDs gets boring. That’s why I enjoy listening to what the latest podcasters have released. 1 Which app to use? 2 How to find them? 3 Which are my favourite podcasts to listen to? If you have one of the older iPods you will be able to use the inbuilt software to listen to the ones you like. There are also ways to listen to them on Android devices, if you google it you will find some guides on how to do that, it is too in-depth for me to write here how to do it so have a search and you will come across very good step-by-step articles. In the application in the bottom left-hand corner you will see a link which is titled ‘Store’. If you click on that it will take you to the directory of what is available to either listen to as a one-off or subscribe if you wish to. Then use the search box to type in the titles I’ve posted. Which are my favourite podcasts to listen to? Now that is out of the way let’s get it on with why you are here, to see my favourite podcasts. Remember that my personal taste obviously dictates what is here. But if you like the topic of them then check them out, they all cost £0.00 after all so you can’t lose. Let’s start with my #1 favourite. 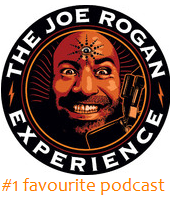 The Joe Rogan Experience – Joe Rogan is an American comedian who does regular podcasts. He has a variety of guests and they discuss a whole range of things. It is very adult orientated so if you have delicate ears then don’t listen to this. However, I find it hilarious and if you are a comedy lover then check one out. BBC Radio4 More or Less Behind the Stats – This appeals to the geek in me. Some of them I don’t like as the topic doesn’t appeal to me, but others are brilliant. They look at statistics which have surfaced recently and delve deeper in to them. I have recently listened to them talking about how accurate dogs ages are when converted to human years and also looking at the claimed figures of Man Utd fans. A lot of the episodes are very interesting. Waking Up With Sam Harris – Brilliant to listen to when in the mood for something that is thought provoking. It’s hosted by Sam Harris, the neuroscientist, philosopher, and author. He also has top class guests on and they discuss important questions about modern society. Ricky Gervais – Massively successful in everything he does I think Ricky Gervais was the main reason I started listening to podcasts. They no longer do regular ones however he still uploads new bits. Such as Equality Street which he did recently for charity, and also ‘Learn Guitar with David Brent’ which is very funny! You can also still see past episodes and listen to them. Some very funny conversations with Karl Pilkington and Steven Merchant in there. Tiestos Club Life – If you are a fan of dance music then you will love this. If you don’t know who Tiesto is then this isn’t for you. Released weekly with new tunes there are plenty of bangers in every episode, especially ideal for when working on a Friday afternoon haha. There you have it, they are my faves for when you are busy making money from home. Check them out if you like the little synopsis I have posted about each. If they don’t excite you have a good look around, and in fact, it is worth searching every couple of weeks for new ones. If you are interesting in listening about ways to make more be sure to check out my very own personal finance podcast. Thanks for reading this page today, I hope it’s a useful resource.